Author ED Martin and I belong to the same critique site. Every Friday she features a different author on her blog, and this week it's my turn. You can read the interview here. I'm super excited to announce that​ copies of Growing toward the Sun are now available at "brick and mortar stores" in several new locations. ​If you live in Central Kansas, you can buy my book at the Happy Hollow Gift Shop in Moundridge. The Gallatin newspaper, The Northwest Missourian, sent a reporter to one of our November guild meetings and she interviewed us all collectively and separately. The full-page article came out in the December 6 issue. The well written story painted our group in a complimentary light and also served as a nice bit of free advertising for those of us with published books. One more thing: my Goodreads giveaway is over but another begins on April 25. Stay tuned. Just a reminder: you still have a couple of days to enter the Goodreads giveaway for ​Growing Toward the Sun. It's open for US and Canadian Goodreads members. Giveaway ends December 31, 2017. My short story "Gabriela's List" will appear in the January publication of Purpose magazine. "Gabriela's List" is a creative non-fiction piece about one of my Romanian friends, a Christian girl with high (maybe too high!) ideals about marriage and a life's partner. Purpose magazine, published by Mennomedia, is a monthly periodical that contains inspirational short stories, essays, and poetry. I recently ordered a year's subscription as a Christmas gift for my grandma. It's available via phone or email at mennomedia.org. Growing Toward the Sun officially goes live December 5th! It will be available in paperback on Amazon, directly from me, and at Bricktown Coffee in Jamesport, Missouri. Ebooks will be available on Amazon. You also have a chance to nab a free copy. I'm giving away two copies on Goodreads, starting November 29. ​Watch for more giveaways - both here on my site and on Goodreads - in the future. My nonfiction story "Talking Hearts" will be published in the August 2017 issue of Purpose magazine. The August issue follows the theme of Staying Connected, which reminded me of all the times I've longed to communicate but couldn't. "Talking Hearts" tells about a visit to Ukraine and an afternoon with a friend. She speaks Ukrainian and Russian; I speak English and Romanian. How can we communicate? Purpose is a monthly periodical put out by MennoMedia. My nonfiction piece "Gabriela's List" will appear in the January 2018 issue. My story "Easter With Baba Olena" was published in the last issue of Highlights. It's so exciting to see my writing in the magazine I've loved since I was a kid, and to know that hundreds of kids from all over are reading it. I've had a wonderful experience with Highlights. The editor and her assistance sent lovely emails, and the edits they made really polished my little story. The illustrator did a great job, too. I especially like Baba's traditional Ukrainian blouse. Best of all, my nephew and nieces were excited about their aunt's publication. They took their copies to school for their teachers to read aloud to the class. And that, of course, makes me pretty much a Famous Person. I’ve had a hefty amount of the first one, thanks mostly to my online critique group. Growing Toward the Sun has been slashed and eased and folded and twisted into something that actually resembles my original dream. This wonderful group also did a lot of paragraph-level edits to my later drafts, suggesting ways to change up my sentence structure, make the paragraphs flow, and etc. My editor has taken care of the rest. I hope...no, I pray...No, I trust. She offered some big picture help, made suggestions for flow and clarity, but mostly she nitpicked my grammar, spelling, and punctuation and did fact checks and etc. Thanks to her, I will no longer have the name of the girls' detective club spelled three different ways in three different chapters. Thanks to her, I don’t spell gray with the American spelling in one section and the British spelling (my fave!) in the next. A daunting stack of papers with an overwhelming amount of red and black and blue ink rest on my desk. A million “to-do’s” flutter through my head, but excitement flutters there as well. Maybe this book will happen yet. 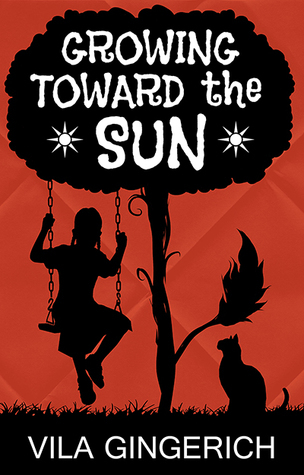 Growing Toward the Sun has not only landed in the hands of beta readers across North America, it also has a cover. A quite gorgeous one. Cover design terrified me, actually, and I had no clue what I wanted. However, I had nothing to fear. The very talented Louis at Indigo Forest Designs read a short description of Growing Toward the Sun, looked over my list of favorite covers, read my mind, and handed over the exact cover I didn't even know I wanted. Now, all I have to do is make the insides as pretty as the outsides.